My tree was beautiful this fall. Wanted to say thanks! I had little expectations from ordering online since this was new for me, but it was well worth it! My tree grew over 4 feet in one year and the color was amazing! Oh my gosh! 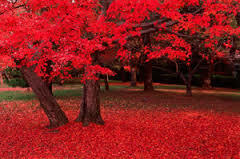 What a beautiful red foliages my trees has! I will send you some pics. 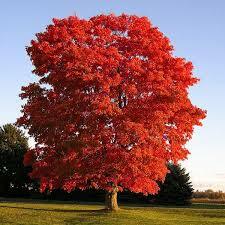 Scarlet Red Maple (Acer rubrum) also known as Swamp Maple, Soft Maple, or Water Maple. Is a common type of deciduous tree that is found in the eastern region of North America. It is a highly variable tree, especially when it comes to its leaves. The most common factor between regions is, however, the origin of its name, the bright red leaves that begin to bud in the fall and winter and blow out to pale flowers briefly before forming leaves that sit oppositionally on the twig. The fruit of the tree is a small reddish-brown samara. Red Maple should never be planted near a location where horses will be present as the leaves, especially when dead, are extremely toxic to equines. These trees should also be used with care as they have varying allergenic levels from one region to another. They are perfect for planting ins large open environments and due to their size of 20 feet at the 10-year mark and up to 92 feet when fully grown (approximately 40 years) they are ideal for filler and blockage usage, especially when planted with other trees which color change to complementary hues. Scarlet Red Maple is aptly named. Its flowers show a deep red with leaves that can take on any shade from red to orange. They make this tree a colorful addition to any garden. This fast-growing tree can gain four to five feet in one year. Moreover, this species of Maple is known for its tolerance for a great diversity in soil. It can withstand drought but is also capable of surviving an extended period of flooding. These beautiful trees add a ton of curb appeal to all lawns where they are attached. They also are very popular with gardeners and landscapers as they are easy to plant and care for and practically need no maintenance at all. These trees are solid and durable and can withstand almost all weather conditions such as snow, ice, and thunderstorms. They supply beautiful color all throughout the year and work great to bring a beautiful and relaxing shady area to a lawn for the entire family to enjoy. These trees also bring those cute little squirrels that love to play in these large trees and also a variety of birds to enjoy. The red leaves this tree produces are bright and brilliant as the fall sun shines on them. These gorgeous trees are shipped to the consumer in their bare root form, so they arrive in top notch condition. Scarlet Red Maples bring lots of life to all locations.